Natarani Amphitheatre, Darpana Academy of Performing Arts, Usmanpura, Ahmedabad, India. 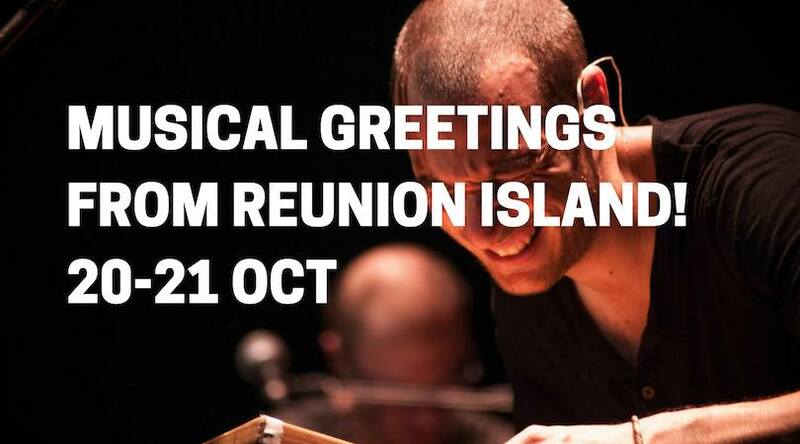 Alliance Francaise d’Ahmedabad and Darpana Academy of Arts with French Institute in India and PRMA, bring you “Musical Greetings from Reunion Island”. Following the festive season of Navratri, join us to celebrate the spirit from a far off land, in form of two concerts, 20th and 21st of October. Dark, political and enraged, this music of blatant beauty has as much to do with Noir Désir or Léo Ferré as with the beautiful indocile traditions of Maloya. Tremendous master of trance and citizen rocker, the singer Carlo de Sacco pushes the asphyxiating borders of the modern life with big gulps of slam rage and poetry ..
A singular voice of Maloya. She is one of the few female voices of Maloya, a charismatic and strong personality. In Maloya, the Reunion Island, where the dead speak to the living, she fills her notebooks in the midst of restless sleep. Members of both Natarani and AF can Pre-book their seats till 18th October. Ticket sales will open for public in the last 48 hours. We request the members to reserve their seats before 18th Oct. Stay tuned for more information.